“Mad Dog Time” is the first movie I have seen that does not improve on the sight of a blank screen viewed for the same length of time. Oh, I've seen bad movies before. But they usually made me care about how bad they were. 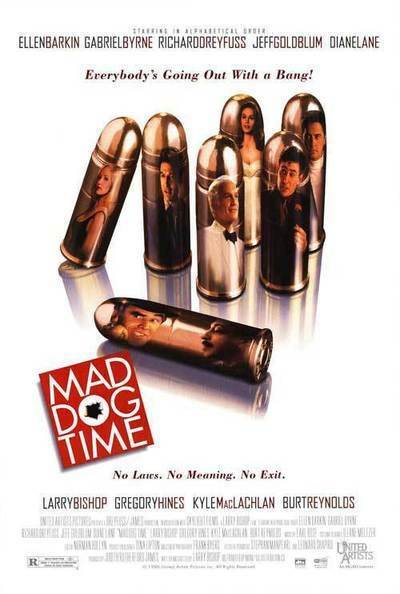 Watching “Mad Dog Time” is like waiting for the bus in a city where you're not sure they have a bus line. The plot: A gangster boss (Richard Dreyfuss) is released from a mental hospital and returns to a sleazy nightclub to take over control of his organization. He has been gone long enough that a long list of gangsters would like to have his job, led by his top triggerman (Jeff Goldblum), who has been conducting an affair with Dreyfuss' girlfriend (Diane Lane) and her sister (Ellen Barkin). The girls share the last name of Everly, so they're the Everly Sisters--get it? Ho, ho, ho. God, what rich humor this movie offers! Other candidates for Dreyfuss' throne include characters played by Gabriel Byrne, Kyle MacLachlan, Gregory Hines, Burt Reynolds and Billy Idol. The way the movie works is, two or three characters start out in a scene and recite some dry, hard-boiled dialogue, and then one or two of them will get shot. This happens over and over. “Vic's gonna want everybody dead,” a character says at the beginning, in what turns out to be a horrible prophecy. Vic is the Dreyfuss character. Goldblum is named Mick, and Larry Bishop, who directed this mess, is Nick. So we get dialogue that thinks it's funny to use Vic, Nick and Mick in the same sentence. Oh, hilarious. I don't have any idea what this movie is about--and yet, curiously, I don't think I missed anything. Bishop is the son of the old Rat Packer Joey Bishop, who maybe got him a price on the songs he uses on the soundtrack, by Dean Martin, Sammy Davis and Frank Sinatra (Paul Anka sings “My Way,” which was certainly Bishop's motto during the production). What were they thinking of? Dreyfuss is the executive producer. He's been in some good movies. Did he think this was a script? The actors perform their lines like condemned prisoners. The most ethical guy on the production must have been Norman Hollyn, the editor, because he didn't cut anybody out, and there must have been people willing to do him big favors to get out of this movie. “Mad Dog Time” should be cut into free ukulele picks for the poor.